Whomp whomp. There're no Bag of Iszs for sale. 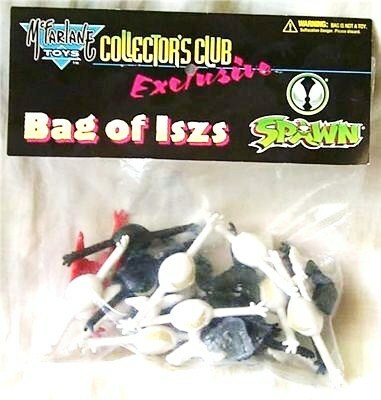 As a stand alone pack of figures, this is kind of without context, but if you own the Maxx action figure, then you need to have this Bag of Iszs. The more Iszs, the better. These guys are all identical figures with bendy arms. They're a reasonably accurate rendition of the little menaces from the comicbooks, all sculpted with identical smiles that make them look both goofy and menacing, which is perfect for the tone of the source material. My pack has 8 white Iszs, 7 black, and one red. I'm not sure what the deal is with the red one, because I don't recall there being any red ones in the comicbook. I guess it's in there to give something 'special' to those who bought this exclusive.